Do you ever feel like you aren't living the life you really want to live? That your dreams and ambitions are going unfulfilled? That you've lost sight of things you're passionate about, and you're not quite sure when you got off-track? I do sometimes. Actually, these days, make that a lot. Maybe your dreams involve publishing your first novel. Maybe you dream of running a successful blog that pays all your living expenses. Maybe your ambition is to hit a certain income level as a freelance writer. Or maybe, like me, you're very happy with your writing career, but you have other dreams and ambitions that haven't been fulfilled. 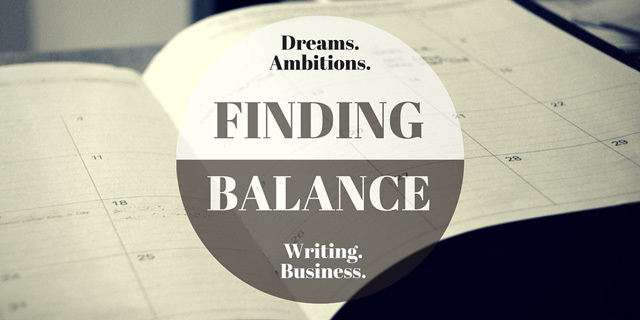 Today I want to talk about finding balance between our writing careers and other passions, dreams, and ambitions -- things that are sometimes too easy to push aside and forget about, even if we don't really want to. Life has been a little bit crazy here since the start of this year. The specifics of what's been going on don't matter. But a lot's changed in my life in just a few months -- improving health, ups and downs in a variety of relationships, personal and professional struggles, but also professional growth in other areas. Overall, this is shaping up to be a great year for my writing and my business. But something's still lacking. And some recent developments on the personal side got me thinking. I had a lot of dreams and goals for my life that have gone unfulfilled so far. And I'm not happy about it. Sure. There were reasons for it. Getting married and moving to a new house were both time-consuming. And then I got sick for several yearsand didn't have my old energy or motivation. All I cared about was fixing things and getting well again. So I'm trying not to be too hard on myself. Still, life's short. There's no time like the present to take a renewed look at some of those plans and see what I can fit into my life now. And there's no reason you can't do the same if you find yourself in a similar situation. What kinds of goals, dreams, and ambitions did I have? I planned to move to DC and pursue a double Master's in International Business and International Relations before pursuing work with a major PR firm or international corporation. I planned to then pursue my PhD and teach part-time further down the road. I wanted to become fluent in five languages (given that I'd planned a career in international relations). I wanted to continue picking up new instruments (while formally trained in clarinet and trumpet, I had a knack for teaching myself new instruments very quickly). I wanted to move to Europe for at least a few years so I could explore that part of the world and spend time researching my family's history there. I wanted to continue to pursue my passion for learning. Then there are smaller goals and ambitions -- all the classics I still haven't read, all the amazing films I haven't found the time to watch, wanting to get back on a more regular workout schedule, wanting to get back to sketching and painting on a more regular basis, and wanting to record an album of my own music finally (I don't want to promote it aggressively or anything; I just want to do it for the sake of doing it). Some of these goals have been tweaked over the years, but none of them ever really went away. That's especially true when it comes to going back to school. I've always been a bit of an "education junkie," always passionate about learning new things. A family member used to tease me, pointing out that "professional student" wasn't a viable career choice. I'm the brand of nerd who reads journal articles, industry studies, and even textbooks just for fun (no joke: one of my favorite things to do is study physics and advanced mathematics when I have the time -- things I gave up when I left an engineering program to pursue public relations). So the fact that I haven't formally continued my education yet is particularly disappointing. I guess you can say I got distracted -- distracted by life, distracted by a business that took quite a lot of my time, especially in the earlier years. And someone recently, though unintentionally, brought some of this to the forefront for me again. So I decided it's time for a change. These things that have always mattered to me -- I'm going to make the time to do as many of them as I can. I'll soon go into more details about my own goals and what I plan to do to achieve them. But first, let's look at some basic strategies for getting the most out of the time each of us has. One of the perks of working for ourselves is the fact that we're in control of our schedules. So if you feel like you're putting too much time into work and it's taking away from other things that matter to you, knock it the hell off! Years ago I cut my work schedule down to four days per week, seven hours per day. I run a full-time business on part-time hours. And it was one of the best decisions I ever made. Lately though, I've been sinking a lot of extra time into work (though largely into passion projects with my fiction). So in my case, that has to stop. I need to bring some structure back to my work life. One of my favorite ways to spend more time on passion projects is to tie them to my writing business. Now, with writing-related passion projects such as fiction that won't immediately pay off, that's easy. I take it seriously as a business venture and look at the business hours put into it as an investment. What about non-writing dreams and passions though? Or even hobbies for that matter? You might be able to tie them to your work too. For example, if you're a freelance writer, you might choose to specialize in one of those areas you're passionate about. Wish you could spend more time watching films? Look for movie review gigs. Wish you could spend more time traveling? Consider becoming a travel writer. If you're a blogger, this is easy. Launch a blog about whatever it is you're passionate about so you can justify spending more time on it. This is why I have a genealogy blog (though I need to spend far more time building it up). If you're making money from your blogs, you can justify the associated expenses and time put in. Are you an author? Look for ways to associate your passions with the books you write. Use it as an excuse to interview people, visit places, and enjoy new experiences as research for your books. This tactic won't work with every passion, hobby, or interest you want to pursue. But if you can spend more time doing things you love by working them into your business model, why not try? Chances are good you waste time in some way or another. I certainly do. So another option for making time to pursue neglected dreams is to take your time back from time-wasting activities. For example, I recently got back into watching soccer. I love soccer. I played for many years, long after I was the only girl left in the league. I only quit when I broke my ankle in five places (at soccer practice no less). I still don't know why I never went back to it. Fear after the injury perhaps, followed by going off to college. I really didn't have time to watch much soccer before. I'd occasionally catch a Bundesliga (German league) game if it happened to be on when I wanted to get away from my office. But it wasn't fun yet. It was just something to do. Then one day I saw a match that made me fall in love with the game all over again. From that point on, I've been watching as much as I can. Each televised match usually lasts a little less than two hours. I didn't have time for that. So I started taking my time back from other activities. For example, I watch almost no other television shows now. And frankly, I don't miss any of them. There are still occasional things I want to watch, so I'll make an exception or binge-watch a season later. But that's rare. I also stopped letting myself get caught up in extra weekend work hours when games are on. Yes, I prioritized having a bit of fun over writing more. And do you know what? My writing is better for it because I don't feel as burnt out. So look for your time wasters. Do you spend too much time watching TV? Try cutting back. Do you waste too much time running errands during the week? Try to group them together to save trips. Do you have too many responsibilities at home and need other members of the household to help out more? Talk to them about it, and delegate. No matter what responsibilities you have, your time is ultimately yours. Start taking some of it back. I know some writers think "multi-tasking" is a dirty word. Get over it. Multi-tasking is only a bad thing when you aren't smart about it. Constantly checking your email while you're working on a client's freelance writing project would be a stupid way to multi-task. But there are plenty of things you can double up on to save time, get more done, and make room for pursuing your other interests. For example, I mentioned television before. What if you aren't willing to cut most of it out? What if, like me with soccer, you have something you absolutely insist on watching? Make the most of that time. You've probably heard people suggest working out or doing short bursts of housework during a TV show's commercials. That might be fine and dandy for some people. But screw that. You can do better. Why not work out while you watch too? Or knit. Or knock out your shopping online. Or clear the spam from your email inbox. Or deal with your social media accounts. Not a big TV watcher? Consider listening to podcasts or audiobooks while you go for your daily walk or work in your garden. Go catch some sun by the pool this summer while you read a good book. Listen to your favorite music and dance around the house for a bit of exercise while you do your chores. As long as one of those things doesn't require a lot of mental energy, it's perfectly fine to do them at the same time. So think about your typical day. Are there any tasks that you can double up on with these new interests you want to pursue? They won't always play nice together. But if you find multi-tasking helps you do more of what you want to do (without burning you out), go for it. Earlier I mentioned some of my key dreams and passions that I've yet to pursue. I've put a lot of effort during the past few weeks into working out a plan to get those interests and priorities back on track, and without sacrificing my writing business. Continuing Education / Relocation -- I'm looking into Master's programs in the media and communications field (no longer having an interest in international relations). I'm looking at programs in the U.S., U.K., and Germany, so the school I end up in will influence how soon I relocate overseas for a while. I'll decide if I still want to move beyond that Master's at a later time. But as of now, I likely will. Language Learning -- I'm going to focus on three languages rather than five (again, not having that international relations goal anymore). That obviously includes English, but also brushing up on my French and then learning German (being a German citizen and all I figure that makes the most sense). I'm starting with French, spending one or two hours per week on lessons, watching one French film each week minimum, and adding French language media sources to my daily reading list. Instruments -- As for picking up new instruments, I'm going to start with the piano as I have some of the basics down but it's been my biggest struggle. I'm going to focus on self-paced lessons for 30-60 minutes a day, five days per week for now. If I still struggle, I'll consider more formal lessons with a local teacher. Reading -- This year is the first in a long time where I've tried to tackle a specific reading list. By keeping it more structured, I find I'm squeezing much more in. And as I get back on my normal sleep / work schedule, I'm hoping to read more every evening to get through that list. Films -- There are also a lot of films I've been wanting to make time for. Horror films are my priority, and I want to watch four or five of them every week. These will likely happen on weekday evenings before I settle in to read. And one weekday I'll tackle a French film as mentioned previously. Anything else I decide to watch will be weekend fare. Artwork -- I mentioned wanting to get back to sketching and painting. For now, I'm focusing more on the former. I've decided to tie this into my work to keep me motivated to pursue it. I finally made the decision that I'll illustrate my picture book manuscripts myself. I'm already busy with preliminary sketches for characters (never was happy with the original attempts a couple of years back). And after a fresh-eyes round of manuscript revisions, I'll start illustrating the first book. Music -- I also mentioned wanting to finally record an album of my original work. This will be the slowest-going project I imagine, mostly because it will involve pulling in a few musicians and others I know to do things the right way. I'm also going to tie this into my work. I've already been working on songs that I want to use to promote some of my fiction (think book trailers, but much better than typical stock-photo-stream trailers). So it might be a slower process, but tying the music to other projects should keep me moving forward finally. Working Out -- I blogged recently about my ongoing health issues, how I finally got past them, and how it led me to start losing weight rather quickly. Now that I'm in a better place, I want to start working out more regularly again (it was a bit sporadic for a while). This should be the easiest thing to work into my schedule. I'm going to do a lot of Pomodoros during my working hours, and I plan to do strength training reps during some of my short breaks, and quick chores during others. I also plan to get on the exercise bike during soccer matches or movies most days, and work in yoga as I'm in front of the TV as well. So the plus side is, this shouldn't take extra time out of my day. It's a great option for multi-tasking. When I'm back on my usual schedule (which I expect to start happening this week), I'll finish work at noon on weekdays. On a typical weekday, I'll have four hours of activities (movie/workouts, reading, and piano). On a soccer day, it'll be six hours. On a French lesson day (which I wouldn't schedule on a day with a match), it would be more like five hours. I need seven hours of sleep per night (eight is too much for me and screws with my head badly). That leaves me with anywhere from three to five hours per weekday to myself on top of time for all of my passion projects. That's time to research schools. It's time to watch an occasional TV show. It's time I can read even more. It's time I can still sink extra hours into work if I really want to. It's time to run errands, do housework, hop in the shower after a workout, cook, garden, lounge by the pool, meditate, play with my pets, take a nap, or do whatever I want. Three to five hours each weekday is a lot of time, so there's no excuse for me to burn out. It's all about sticking to the schedule for everything else. That doesn't even account for time on the weekends (when I tend to see family, deal with most housework, play games, watch more soccer if there are matches I feel like seeing, or go out of town). When you take a good hard look at the time you actually have available during the week, you'll probably wonder why you aren't doing more of the things you really want to do. It was a huge wake-up call for me. "Having no time" is never a good enough excuse. If you care about something, you'll make the time. I'm planning to spend the rest of this week working out a more specific schedule for everything and getting my sleep schedule back on track. Then next week I'll get back to more of the things I love. What about you? How much time are you actually wasting every week? What dreams do you have that you want to make time to fulfill? What passion projects do you wish you had more time to pursue? And, most importantly, what do you plan to do about it? It may sound strange, but I’ve never really allowed myself to have dreams. I know it’s rooted in childhood tragedy, which left me knowing things won’t always work out the way you want them to, so why get your hopes up? Life taught me early on to anticipate the worst so you’ll be happy if/when it doesn’t come to be, than said when something positive doesn’t happen. Oddly enough, that can also be a form of motivation. Because I write a lot about TV, I have to watch several hours per day, but I multi-task (yes, even knitting, when the puppy allows) while watching TV. One thing I’ve discovered along the way? Taking a 20 minute dog walk can really re-energize me. It clears my head and allows me to refocus on what I need to do. Oh, Paula. I think my heart just broke a little bit for you. That sounds like such a sad way to grow up. If I didn’t I have dreams and a stubbornness to pursue them (even if not always as quickly as I would like), I don’t know where I’d be today. Certainly not writing for a living. Certainly not running a business. Hi Jennifer: Very interesting blog. Thank you for sharing your many creative ideas. I wish you much success in pursuing your goals. I suspect that ‘boredom’ is not in your vocabulary. My long-held dream of moving back to Europe is in the process of becoming reality (although it’s England, not France, for family reasons–but hey, France is close!) The move has absorbed pretty much all of my time for months, and right now I’m in the overwhelmed and slightly terrified phase as the moving date draws near. Where does that leave my dreams? Well, the uncertainty about where we’d be living will be removed, so once we’re there and settled in I plan to get out my planning notebooks and do some serious long-term thinking. A long process of soul-searching last year has helped me determine where I need to focus my energies, and has left certain goals clearer than before. The advantage of keeping planning notebooks is that it’s all there, just waiting to be re-read and re-thought. Oh, you want to know my dream? Very simply to make a living from my fiction. Not a fortune, a modest living, so that I have time to do the other things I love best, which are to get outside in the fresh air (LOTS of that where we’re going) and enjoy the family who’ve been so far away from me for almost 20 years. To spend more time with my husband–part of the making a living dream is to allow him to spend more time doing what HE likes instead of working 9-5. Yep, pretty modest dreams. Perhaps that’s because of my age–I seem to remember more ambitious dreams a few years ago. Or because I’ve found the one thing I love the most, and all other ambitions seem hollow now. Wow, when you said you had a post coming about finding balance, I had no idea how much you’d deliver! Great stuff, Jenn. What I love about your blog is the personal angle you take with everything. Makes it so much more compelling to read (and makes me want to boomerang back here every time). How much time do I waste per week? Too much. I’ve watched myself futz around for an hour or so some mornings. Those are the days when I have to shut off email and the phone and just buckle down. Luckily, these days don’t happen often, though today is one. What dreams to I have? Publishing poetry. I want to get a book published — not just random poems. I’m working toward that, though lately not so feverishly. Actually, that is my passion project, so the fact that I’m spending any time at it already is a bonus. More is needed, however. What am I going to do about it? I’m going to take these days where I can’t get myself focused on the work at hand and allow myself to “play” with what I really want to be doing. Today, I could have spent an hour and a half at it instead of checking Facebook, reading up on blog themes, fussing with web design I’m not nearly ready to change…. Maybe your next post should include advice on how to stop beating yourself up for slipping. 😉 Best laid plans indeed — it happens. There are days I sit at this desk and can’t focus on anything beyond blogs and forums. I’m still beating myself up for slipping in some areas. Last night was very emotional. I’d just been in touch with a few professors in programs I’m considering (it’s kind of amazing how many I knew from my PR consulting days — never realized it until I needed that network!). And chatting about their degree programs and finding the right track for a later PhD if I still choose to go that route — well, it was both encouraging and a reminder that this is something I could have (and should have) done years ago. I screwed up in some important ways, time got away from me, and now things are going to be a bigger challenge because of it. And yes, I’m beating myself up over it more than a little bit. You can’t imagine how tempting it is to just apply to the first semi-relevant local program I can so I can get started (though right now the best fit looks like one based in Leeds in the UK). So it’s taking every ounce of self-control to wait, keep comparing my options, and make sure I find the best program I can get into, based on what I want to do. So I’m not sure I’m ready to write about that yet. 😉 Though, I’m picking myself up as best I can. I’ve been building my professional library up more (mostly media and comm theory books I need to brush up on or books from colleagues in the field that I haven’t caught up on in the last few years). I’m spending even more time digging into recent comm-related research and studies. I’m re-launching NakedPR once the site design is finished (and while still hopefully a bit disruptive and with a bit of bite, it’s going to involve far more serious critical analysis). I’m turning more attention back to my own presence in that industry (which was even stronger than my presence in the writing community, which took far longer to build). And, along those lines, I’m even thinking about doing some minor consulting again. Allowing myself to write outside of “work” aka write fiction that isn’t for publishing and literally just for fun has been a big deal for me. Silly as that sounds, I got more comfortable in my work, I started making friends. I am a recovering workaholic, with little to show for it, because I just always overspun my wheels.